Islamabad, Oct 31- An editorial in a leading English daily Saturday maintained that much of US Secretary of State Hillary Clinton's harsh words on Pakistan's lack of seriousness in tackling the Al Qaida were true and that Islamabad should be honest enough to accept this. Another editorial in the same vein said the "circumstantial evidence" of Al Qaida's presence in Pakistan was "unending". Islamabad, Oct. 31 : Visiting US Secretary of State Hillary Clinton continued to reprimand Pakistan on its laid back attitude towards tackling the terror menace, and has said that the country can not come of the crisis until it works sincerely to dispose-off Al-Qaeda and other outlawed organisations. “I think it is absolutely clear and I am convinced that you will never rid Pakistan of the threat of terrorism unless you rid it of Al Qaeda,” Clinton told media person here. Islamabad - US Secretary of State Hillary Clinton on Friday had her first face-to-face interaction with tribesmen from Pakistan's violence-plagued north-western areas, a day after she urged Islamabad to eliminate al-Qaeda from the region. The meeting was part of a deliberate "reaching-out policy" to a cross-section of people to get first-hand impressions about the militancy from the people directly affected by it and to address rising anti-Americanism. Lahore, Oct 30 : US Secretary of State Hillary Clinton’s visit to the city caused severe traffic problems for citizens and crippled their daily routine, as every area the dignitary visited was cordoned off due to security reasons. New York, Oct. 30 : While using her three-day Pakistan tour to try to allay the widespread anti-US sentiments prevalent in the country, US Secretary of State, Hillary Clinton also made it a point to reprimand Islamabad over its numerous fallacies. The way Clinton underlined that it was hard to believe that the Pakistan government has no idea about Al-Qaeda leadership's whereabouts, suggests the US' frustration over that government's denial regarding the presence of terror safe haven inside its geographical boundary. Lahore, Oct. 30 : US Secretary of State Hillary Clinton, who is on a three day tour of Pakistan, has reiterated that Al-Qaeda leadership is present in that country, and said that it is hard to believe that a civilian government has no idea about its whereabouts. “I find it hard to believe that nobody in your government knows where they are and couldn’t get them if they really wanted to,” The Daily Times quoted Clinton, as saying. Islamabad, Oct 29 : US Secretary of State Hillary Clinton has said the advance of extremism in Afghanistan and Pakistan is a threat to America’s security. 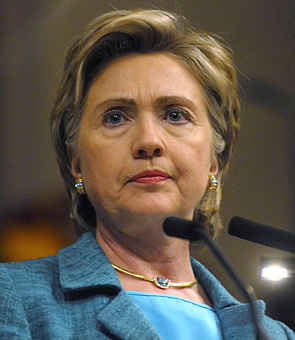 Addressing a joint press conference with Pakistan Foreign Minister Shah Mahmood Qureshi, Clinton said Al-Qaeda and their extremist allies were not only attacking friends and allies of US like Pakistan and Afghanistan, but are also bent upon attacking American citizens and their interests around the world. Washington, Oct 28 : Warning Pakistan that the direct threat from violent extremism it faces could destabilise the entire region, Secretary of State Hillary Clinton has voiced the hope that the India and Pakistan will resume their stalled dialogue. "But what we see as the direct threat to Pakistan right now comes from the violent extremism," she said. Islamabad, Oct. 28 : US Secretary of State Hillary Clinton, who arrived here on a three-day visit early on Wednesday, has urged Pakistan to realise the threat facing the country’s nuclear armaments, adding hat Washington was still worried about nuke proliferation. Interacting with media persons travelling with her, Clinton said banned organisations such as Al-Qaeda are always on the look out for acquiring the nuclear know-how’s and raw materials with an aim to expand their reign of terror. Washington, Oct. 28 : US Secretary of State Hillary Clinton arrived here early on Wednesday on a three-day visit, which she described as a very important tour to allay all misunderstandings between both countries. This is Clinton’s first visit to the country since taking charge in the Obama Administration. Talking to mediapersons on-board the special aircraft en route to Islamabad, Clinton said it was imperative to resolve all issues between the two countries and broaden the agenda for cooperation. Islamabad - US Secretary of State Hillary Rodham Clinton arrived in Pakistan Wednesday on a three-day visit aimed at deepening bilateral cooperation and helping its close ally tackle Taliban militancy. Clinton began her first official visit to Pakistan as it reeled under militant violence, with the military battling Taliban and al-Qaeda fighters in the South Waziristan tribal district along the Afghan border. Washington, Oct. 26 : Terming US Secretary of State Hillary Clinton’s forthcoming visit to Pakistan as a ‘people-to-people trip’, Obama Administration’s Special Representative for Afghanistan and Pakistan, Richard Holbrooke has said that Clinton’s trip to the troubled nation would be one the most important foreign visits of the top American Diplomat. Washington, Oct. 24 : US Secretary of State Hillary Clinton would soon be visiting Pakistan with the aim to strengthen the strategic relationship between both countries. Addressing mediapersons during a briefing here, US Assistant Secretary of State P. J. Crowley said Clinton would meet President Asif Ali Zardari, Prime Minister Yousuf Raza Gilani and other top leaders of the country. Crowley, however, did not disclose the exact date of Clinton’s visit. Washington, Oct. 23 : US Secretary of State Hillary Clinton has said that Washington was watching the developments in Pakistan country ‘very closely’ in respect of the safety of its nuclear weapons, even though they believed that there was no immediate threat to them. Washington, Oct. 23 : Describing the Indo-US civil nuclear co-operation deal as a ‘landmark’ agreement between the two countries, US Secretary of State Hillary Clinton has said that Washington has complete faith in New Delhi and envisages it to be a ‘major player on table’ in the 21st century version of the Nuclear Non-Proliferation Treaty (NPT). Washington, Oct. 22 : U. S. Secretary of State Hillary Clinton has said that the recent spate of terrorist strikes in Pakistan has highlighted the fact that the threat to that country was expanding. Interacting with media persons at the White House, Clinton said the audacious terror strikes inside Pakistan have certainly raised concerns over the authority of the state. 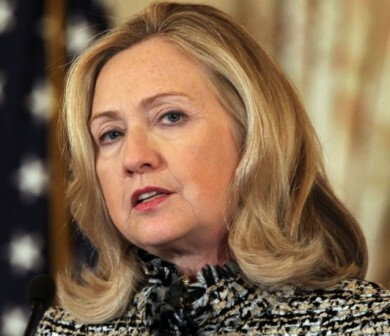 Clinton, however, said that there is no ‘immediate’ danger to the nukes. Washington, Oct 22 - Viewing the landmark India-US civil nuclear deal as part of a broader strategic dialogue with New Delhi, Secretary of State Hillary Clinton has said the US wants India to be a "major player" in working out a new non-proliferation regime. Washington, Oct. 16 : Americans view US Secretary of State Hillary Clinton more favourably than President Barack Obama, a new Gallup poll has revealed. Clinton generated a 62 percent favorable rating against her former rival Obama, who managed only 56 percent. 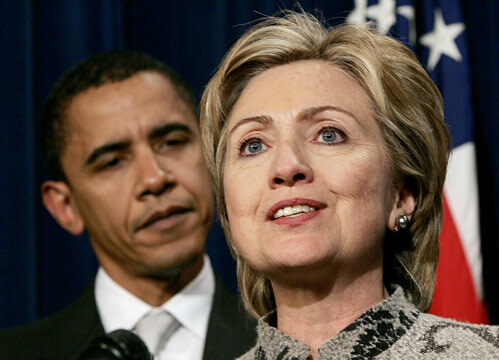 Clinton''s ratings have not changed much since Obama took office and nominated his former Democratic primary foe to be his Secretary of State, Fox News reports. Obama''s rating has plummeted steadily, down 22 points from his 78 percent rating in January. Moscow - The United States is prepared to permit Russia to inspect its nuclear facilities, US Secretary of State Hillary Rodham Clinton said Wednesday. Russia would be allowed to check compliance under this arrangement, Clinton said in an interview with Echo Moskvy radio in Moscow. The US hoped it would be allowed to inspect Russian facilities in return. "We want to create such a system of control," Clinton said. The deal would form part of the new strategic arms reduction treaty being negotiated between the two powers. Moscow - US Secretary of State Hillary Rodham Clinton was in Moscow on Tuesday for talks with Russian leaders aimed at gauging their support for sanctions against Iran if it fails to live up to its obligations on its nuclear fuel programme. 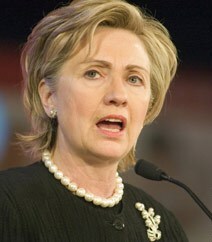 Clinton was due to meet Foreign Minister Sergei Lavrov and President Dmitry Medvedev. The talks come amid growing international concern over Iran's nuclear programme. Last month, Tehran, revealed the existence of a second nuclear plant as part of its nuclear programme, which it insists is for peaceful purposes.